While there is no chance that I will build such database myself, I’m pretty sure we have a chance of making one together! I will try to add some benchmarks from time to time, for various problems. This way, when you will learn, you will have a chance to check if what you do “gives” correct answers. If you have some examples solved in FEA, that would be good for this purpose let me know (enterfea@enterfea.com, or in the comments below). Building such a database really would help us all! I couldn’t create a benchmark from the scratch in a day, but I dig out a benchmark I had in the archives and refresh it a bit! You try to solve a problem of a different kind for the first time or after a long break! When you bought a new software package or created one yourself. When you are just learning about something, and you are not sure if what you are doing is correct. Or maybe you have come up with a new approach to solving nonlinear problems and you would like to validate it. It’s also possible that you just opened silo code EN 1993-4-1 and have no clue where to take the required comparison outcomes from. In all of those cases making a benchmark is a good idea. If you have never met the term before, to do a benchmark means to solve a problem you already know the solution of (and that you are certain of it). This way, you can test your FEA setup, and hope that it will produce correct answers. This way, you may be sure, that the procedure you will use in other, similar problems works properly! There are of course benchmarks for a lot of problems. Today I will discuss one for geometric nonlinearity in shells. This is most likely one of the most famous tests, widely used in a lot of scientific papers! It was originally published by prof. Rotter in 1989, but since then it was done and re-checked by a lot of people doing shell design. If you are interested original text it was published in Journal of Structural Engineering, Vol. 115, May 1989. It described a popular imperfection shape caused by welding depression dividing this shape into “Type A” and “Type B”, hence the name of the benchmark (as well as one of the popular imperfection shapes used in the design of shells). The problem itself was described very well and easily allowed for reproduction of this analysis, which is one of the reasons why it became so popular. The original text discusses outcomes from analyzes using those imperfections, but here we will focus on a specific case described in the paper (there were several there). 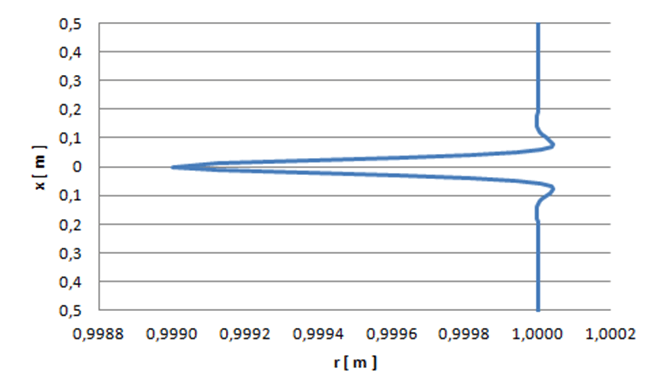 Create a shell model with the length to radius ratio L / r = 3. 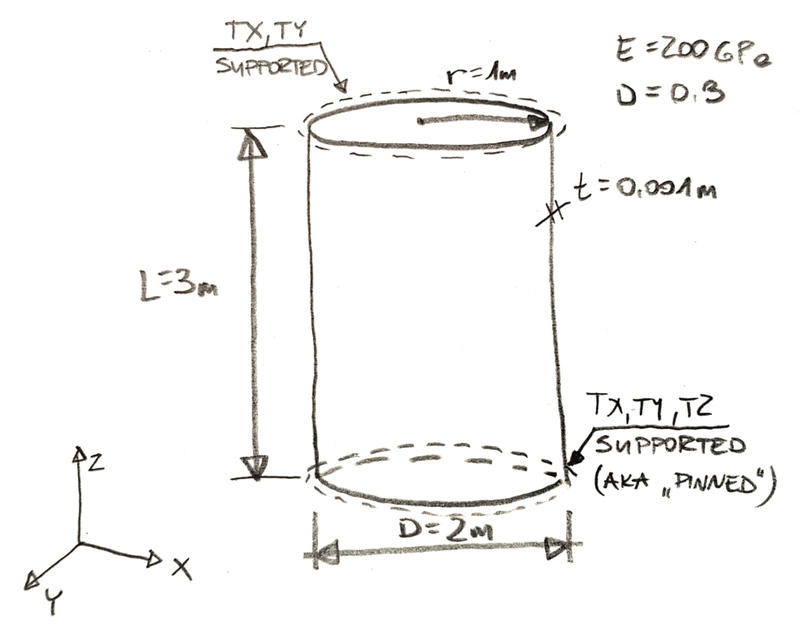 Radius to thickness ratio of the shell is r / t = 1000. Material is linearly elastic with E = 200 GPa and Poisson’s ratio v = 0.3. Shell is simply supported at ends (S3), and even a mesh size is defined in the region of imperfection as 0.25√(rt). At the top, you can support translations in horizontal directions, while at the bottom all 3 translations. If you want to use a cylindrical coordinate system, just remember to “point” Z-axis as I did here and all remains the same! In all honesty, I hate symmetrical uniformy supported shells! They always give trouble with convergence. Analitically, discretely supported shell is almost impossible to solve… but in FEA it’s actually the easier case! This is of course not the end of “fun”. After all… we are missing the imperfection! Where: is the imperfection amplitude (it this benchmark equal to t, so in the “example” I’ve described above that would be 0.001m or 1mm). The “x” is a coordinate along shell length (x=0 in the middle of the shell where the imperfection is applied). This means that the imperfection has a maximal amplitude in the middle of the shell, and it changes starting from the middle in both directions! The “x” coordinate in the vertical axis on the chart is the one shown in green on the drawing above. Maximal deformations are in the middle of the shell. Also, maximal amplitude is to the inside (this is why radious is smaller than 1 in that direction). I think it is self-explanatory at this stage. You should implement such a shell with such imperfections and load it as we discussed. 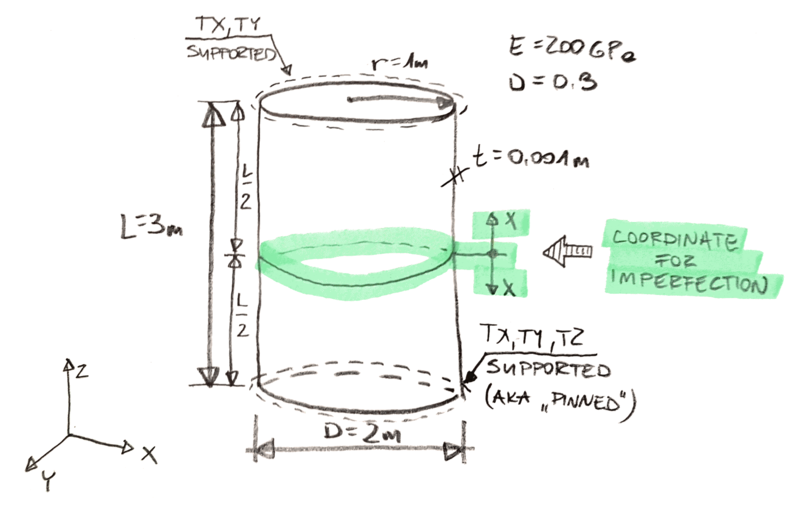 The task is to calculate the critical capacity of the shell… so the load under which the shell will buckle. Note, that you should use nonlinear geometry, but elastic material property (material is elastic)! This is when the benchmark starts. If you want to test your “nonlinear geometry skills” give this task a swing. I admit it made me sweat when I attempted it for the first time! Good luck! If you don’t know how to implement such imperfection to your model, I discuss this first below – you can peek there without looking kudos I guess! The easiest is to draw such chart into your CAD software (this can be easily done with generated point coordinates in Excel), and then copying such line into your FEA package and creating shell by rotation of this line along the axis of the shell. Just pay attention where the line is and around which axis you will rotate it! Some time ago I wrote a script that manually generates such weld depression on a given height in a shell, but this is mostly since I use it as imperfection in some shell designs. If you wish to make a benchmark only – then there is no point in making such script, just import the lines from CAD software and you’re done. I went’ “scientific” in the charts – yours can be simplier. The idea here is that the delta (horizontal axis) is the vertical deformation of the top edge of the shell. On the vertical axis, you see the stress I’ve got, divided by the “theoretical” critical stress according to Timoshenko equation. This is how the benchmark is solved “oryginally”. I will describe how it is done below! If you have defined more steps, the post-critical path may be much longer. Usually, when I do benchmarks I tend to leave only a few increments after failure which is quite easy… since I know the outcome from the start! This saves an enormous amount of computing time! This is also a very good example on how to use subcases. Notice that at the start I only have few “dots” on the chart. I knew nothing will happen there, so I allowed solver to go “quickly”. Then, near the capacity (I knew the outcome before I’ve started so I could set that manually! ), I’ve made the steps much smaller, so I could “catch” the proper outcome! This is however not the main “issue” here. Clearly, this is not a load multiplier, nor load, nor even stress! The outcome of the paper is given as a “non-dimensional” value. Stand back, I’m about to do science! With this note, the outcome is a relation between compressive longitudinal stress in the shell denoted as (simply edge load in kN/m divided by shell thickness) and “classical” stress. I can calculate that the is 121MPa x 0.306 which gives 37MPa. That is the compressive stress in the vertical direction in our shell. Knowing that the shell is 0.001m thick, I know that such a compressive stress will be caused by 37kN/m of longitudinal compression (force along circumference). This is how I knew that the capacity is 37kN/m, and this is also what you can have on your vertical axis of the chart… if you don’t feel like getting the scientific outcome! If you received the same outcome… everything is fine – you did a correct job! If not, try to tweak your analysis settings and, check if the model response you have received is symmetric (it should be, if not something is wrong in the model). And if everything else fails, make sure that the actual shape you are using is correct! Let’s make this a challenge – if you will manage to solve this, make a small screenshot with your solved model (and the chart) and send them to me. I will add you to the hall of fame! I trying to understand how you obtain 18 circumferential full waves as using n=0.909*sqrt(r/t) gives approx. 28 full waves for your geometry. Can you elaborate? I guess you are using some form of the equation to estimate the amount of buckling waves along the circumference. But I highly doubt someone actually derived an equation for this case… which means this is most likely for something else. Remember that the imperfection can (and will) influence the amount of buckling waves you get. You can also check the animation for the outcome, or simply read prof. Rotter paper. well I actually did your benchmark given above using the same geometry and material properties and I get a snap-thro at P/Pcr = 0.34 (pretty close to what you have!) and I get 28 full waves in the hoop direction at the onset of buckling. I’m trying to reason out why you obtain 18? Well… there may be a lot of reasons – first of all, we didn’t get the exact same answer – this is the most obvious one I guess. Assuming you have the model right (and why wouldn’t you, but just double check for sure), this may be related to a “too high” time step in the analysis. I’ve seen such things before, especially if the entire circumference of a shell fails at once. I hope you will find the solution! Hmm… You estimate the capacity of the shell to be 31% of Pcr and I estimate it to be 34% of Pcr. To me that is within engineering accuracy. Unless we happen to use the same software version, same element type/topology, same integration rules, etc etc, I’m would be satisfied matching the load carrying capacity of the shell in your benchmark to engineering accuracy. Since you say this is a benchmark problem how woiuld you cross-check the circumferential mode number that is obtained from FEA for this axi-symm imperfection? Can you post the reference? Sure, it is within engineering accuracy – I absolutely don’t argue with that. But then… why do you worry so much about the number of circumferential buckling waves if you are for engineering estimations? That being said the benchmark pretty nicely describes the element used and all that. And the reference is in the post itself. It’s the prof. Rotter article published in Journal of Structural Engineering, Vol. 115, May 1989.
why do you worry so much about the number of circumferential buckling waves if you are for engineering estimations? As for an imperfect shells, the critical mode is moderately well defined (though a few adjacent modes are often close) for a given imperfection form and amplitude. Thats why! Anyway I’ll look out for your source on the critical mode number definition. I must admit I don’t fully understand where you are going with this. I feel we are running in circles. Yes, in shells the number of buckling waves is usually quite nicely defined. But also as you yourself wrote few adjacent modes are close to each other. You got a close “but not perfect” outcome… so most likely you have just hit one of the adjacent modes with a different amount of buckling waves. For me, this is a closed case. I already provided you with the source of all the information. Amount of buckling waves is defined and described (for a lot of similar cases of this imperfection, and the one I’m describing here specifically) in the original paper of prof. Rotter. In this article professor simply describes how many buckling waves are there for various r/t ratios and imperfection amplitudes and the critical load value correlated with them. This is where I knew from what is the correct answer and the correct number of the buckling waves (not to mention that I did the case myself and got the same outcome). Without you reading the original article, there is no point in discussing this further. And, if you don’t trust in the article itself (and all the people who reproduced this case, and trust me there were plenty of guys far better than me doing that) I think it is you who should try to prove that it is wrong – if you can come up with something interesting (like a proof of some sort that this is false) I would gladly discuss it, but until then I don’t think I can add any more to this discussion. I kinda of thought when I said earlier “Anyway I’ll look out for your source on the critical mode number definition.” I meant to drill down into your source article to understand its conclusions in greater detail and understand my mode number mismatch. Thats is all. I obviously have no intention of wasting both our valuable time in ‘going round in circles’. good day and thanks for the article! Och ok – in that case, this is a misunderstanding. By all means, read the article (it’s a good one as most if not all prof. Rotters) and give it as much thought as you think necessary. When you come to conclusions I would love to learn about those, so we can discuss this further. On that note, have a blast, and good luck with figuring stuff out. I remember when I was doing my Ph.D. that such “sitting over articles” was quite fun (but often frustrating at times). I sometimes regret that I don’t have enough time between the company, blog, online course and 4 kids to do that anymore. I always promise to myself that I will read those all new articles as I used to do, but I wonder if this will ever happen. I’m a bit jealous you have the time for such inquiries – without a doubt, you will learn a lot this way! This tube example looks unreal. Usually those kind of thin wall tubes are suffering of cripling. Bucling is not critical for sure. I’m not sure what failure mechanism you describe as “cripling” – would you care to elaborate? Hey, thanks for answer! Well I don’t question those guys and their ideas. But let me show you my experience and reveal some imperfections of this example. So crippling is a failure whiсh accompanied by distorsions, local bucklings, local plastic deformations, etc. And it is point of no return. After it structure is not capable to carry load anymore. Please see the video with coke can below. Especially the moment of failure (with 0.25x speed mode). By the way if can’s wall thickness was thicker this effect would be more visual. Thanks and have a perfect day! Well… for me, this looks like a normal stability failure (aka buckling). Sure it happens in few places depending on the initial imperfections, but I still would call this buckling. Perhaps I simply don’t know something… but I still don’t get what that crippling is – I simply never encountered the term before! BTW in the ideal shell with one imperfection (like in the benchmark) I would say that the failure mode would be around this imperfection. Is there a place I could read something about crippling? Some scientific articles or something? Compression in members can cause local instability failure (usually referred to as crippling). Do I understand correctly that your doubts come from that fact that this is a very localized failure (i.e. on one height along circumference)? Failure of the shell like that could easily happen like the one you mentioned in the videos you linked too… but that would require a different set of “random” imperfections, not only this “idealized” welding depression and nothing more. Perhaps this is what we should have discussed in the first place? Let me know what you think! Yep, probably you are right, that it is aviation industry term, we called this thing slightly different when I studied in university. In my opinion this is a set of plastic buckling failures across entire detail which cause plastic deformations and lost of compression capability of whole detail. By the way look on figure 10.8.1 in Niu book. You will see that crippling is critical failure mode for patterns with low flexibility. Ha-ha loool )) Legal means open source. Because at work I usually use internal documents / manuals regarding this topic and can’t share them. Can you post of a video of the same problem or atleast provide a link of the FEMAP file / Rstan file which you used for this analysis?? In all honesty… I don’t have that model anymore. Sadly GNA benchmarks tend to take a lot of disc space due to a lot of steps being done in the analysis, and this has some serious element count as well… so I don’t keep them around.